Sign up today to receive the latest news. 100% Satisfaction Money Back Guarantee. In addition to the one year product warranty, a 14 day money back guarantee is offered: Return it for any reason if you're not happy. International orders may include extra import duties and/or taxes according to the laws of the target country. Contact us for custom shipping. (PayPal account *not* needed to pay by credit card). Our payment processor will automatically convert the amount to your local currency. Orders ship direct from our Felston partner in the US within 1 day of ordering, most ship the same day. We've worked out an exclusive deal for our members to bring you this product at a price lower than what everyone else pays anywhere on the internet. The definitive answer to correct lip-sync error for up to four sources. When you watch TV or movies, do you ever notice how picture and sound are sometimes OUT OF SYNC? The presenter's lips don't move quite at the same time as their voice? Irritating isn't it. This is known as lip sync error. Even if you haven't consciously noticed lip-sync error (we avoid this impossibility by subconsciously looking away) research at Stanford University discovered it causes a negative impact on our perception of the characters and story. Lip sync error affects a huge number of displays, including modern plasma TVs, LCD screens, DLP TVs and digital projectors. The Felston DD740 solves the frustrating problem of lip sync error for anyone with an A/V amplifier or home theater system. What causes lip sync error? There are many causes but most boil down to the video signal being delayed more than the audio signal allowing speech to be heard 'before' the lip movement that produced it is seen. Digital image processing within broadcasts and within modern displays delays video and allows audio to arrive too soon. Sound "before" the action that produces it can never occur in nature and is therefore very disturbing when the brain tries to process this conflicting and impossible visual and aural information. Most people initially only notice lip-sync error when it exceeds 40 to 75 ms but this varies enormously and really depends upon the individual's defence mechanism - how far he can look away from the moving lips so as to ignore the increasing lip-sync error. We call the value at which it is noticed consciously their "threshold of recognition". An individual's "threshold of recognition" falls greatly once it has been reached and lip-sync error has been noticed. At that point their defence mechanism can no longer compensate and the sync problem enters their conscious mind. The same person who was never bothered by a 40 ms lip-sync error may, after noticing 120 ms error, become far more sensitive and notice errors only a small fraction of their previous "threshold". Many people can "see" lip-sync errors as small as "one milli-second" and some can even detect 1/3 ms errors. How do you fix lip sync error? The only way to correct lip-sync error caused by delayed video is to delay audio an equal amount. The Felston DD740 digital audio delay solves lip-sync error by letting you add an audio delay to compensate for all the cumulative video delays - no matter what their cause - at the touch of a button on its remote. It connects between four digital audio sources and your AV receiver (or digital speaker system) allowing you to delay the audio to match the video achieving "perfect lip-sync". Unlike the audio delay feature found in most a/v receivers, the DD740 is designed for easy "on-the-'fly" adjustment while viewing with no image disturbance. This makes fine tuning for perfect lip-sync practical as it changes between programs or discs, and the DD740's 680ms delay corrects larger lip-sync errors common in HDTV. Why doesn't HDMI 1.3+ fix this? The widely misunderstood "automatic lip-sync correction" feature of HDMI 1.3 does nothing more than "automatically" set the same fixed delay most receivers set manually. It does nothing to correct a/v sync error already in broadcasts or discs which changes from program to program and disc to disc. Ironically, it can make lip-sync error "worse" when audio arrives delayed. Does the Felston DD740 work with HD lossless audio found on Blu-ray discs? No. The Felston DD740 is a S/PDIF coax/toslink device. Lossless audio such as DTS-HD Master Audio and Dolby TrueHD found on Blu-ray discs is only available over HDMI. 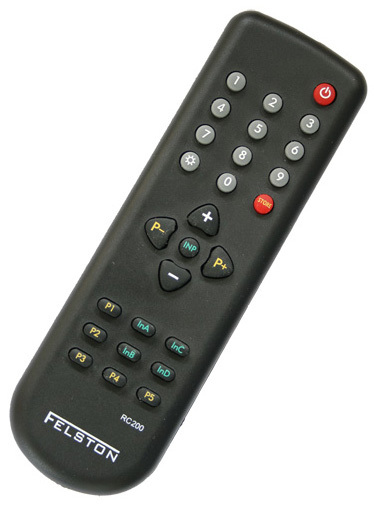 The Felston DD740 works great to fix lip-sync issues with DVDs and broadcast TV/HDTV/TIVO/AppleTV/etc. where lip-sync issues tend to occur the most (and HD lossless audio does not and cannot exist). Are there any similar products to correct HD Audio lip-sync error? We are not aware of any similar audio delay boxes that accept HDMI. There are other manufacturers of s/pdif delay boxes similar to the Felston DD740 but both are over twice the price and don't offer as many features (neither has numeric pad delay entry, 36 presets, or 1/3 ms adjustment). An HDMI delay box would need to an HDMI "repeater" (often called a splitter) since the HD Audio is HDCP encrypted along with the video. It would require an HDMI "receiver" chip (like TV's have) to decrypt the audio and video data and a "huge" memory to store it for delay but it would also require an HDMI "transmitter" chip (like a Blu-ray player has) to HDCP encrypt the re-aligned audio and video for output. If an HDMI delay box ever comes to market it will no doubt be expensive but like our other products we would offer it to our members at the best price on the internet. The Felston digital audio delays solve lip-sync error by allowing you to delay the digital audio signal to match the delay* in the video signal thereby restoring perfect lip-sync. 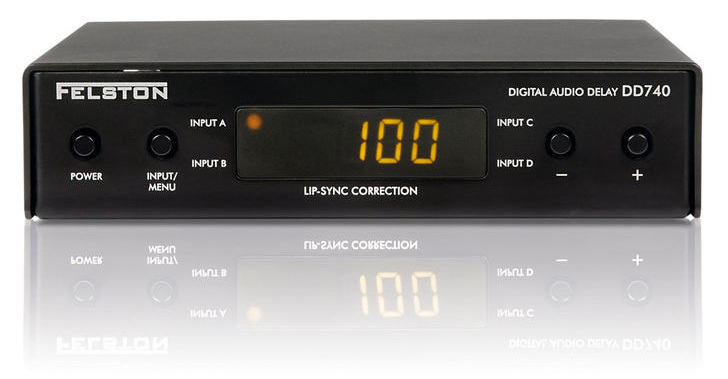 The delay unit is inserted in the digital audio path between your video source (DVD/Blu-ray disc players, DVR, etc.) and your AV receiver as in the diagram above. Since the DD740's "bit-perfect reproduction" does not change the digital audio signal, it is compatible with PCM and all present and future s/pdif surround sound formats at both 48 KHz and 96 KHz. Since there is nothing in the video or audio signal to define when they are in sync it is a subjective adjustment and this is where the remote control excels. It remembers the last delay setting used on each input and includes 36 presets where common delays can be stored for instant recall. But most importantly, the + and - buttons allow dynamic "on-the-fly" delay adjustments while watching with no image disturbance - an essential feature allowing tweaking for "perfect-sync". These are necessary features for true lip-sync correction and not generally available on even the most expensive AV receivers that claim a lip-sync delay feature. At first thought it might appear the DD740 audio delay could not correct for "already delayed audio in the arriving signal" but in conjunction with the video delay of your LCD, DLP, or plasma display it actually can - up to the display's video delay. That is, if your display delays video 100 ms your DD740 will correct lip-sync errors from 100 ms audio lagging to 580 ms audio leading. * Normally lip-sync error is due to video delays in both the arriving signal as well as in the display allowing audio to arrive too soon but when broadcasters over-correct for the video delay they added the arriving signal might have audio delayed instead of video. In standby mode, audio passes through with no delay while coax to optical and optical to coax conversion remains active. When the DD740 is switched on, the signal is output with your last selected delay. When you notice lip-sync error, correcting it is simply a matter of adding or subtracting audio delay. The plus and minus delay buttons allow adjustment in 1 ms steps (or even 1/3 ms). You adjust while watching your program and there is no image disturbance at all as you press the buttons and shift the audio into alignment with video. As you use your DD740 you will notice that different sources, different discs, and different broadcasts require different delays for perfect lip-sync so the DD740 includes 36 delay presets (9 per input) to remember these commonly used settings making it easy to get to the optimum delay quickly. It also features direct numeric entry so if you know the desired delay you just enter the numbers. 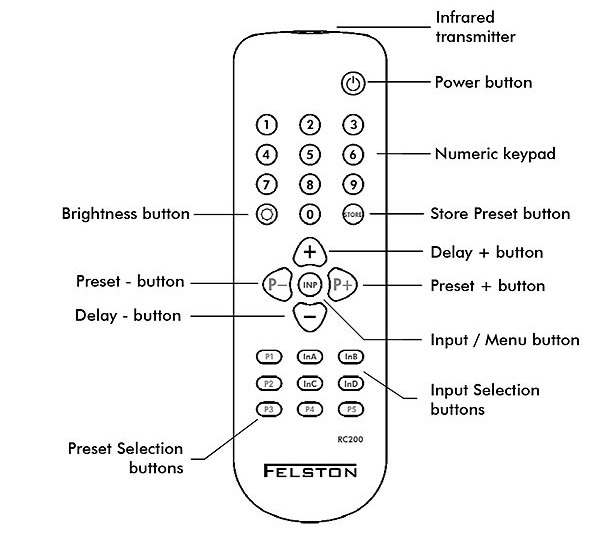 That feature is even more valuable when used with programmable learning remote controls (e.g. Pronto, Harmony, URC, etc.) since it allows full control of the DD740 using its comprehensive discrete IR commands. A/V receivers do not offer all these DD740 features but the most important and overriding advantage of the DD740 is the ease of delay adjustment while watching with no image overlays to disrupt your viewing. With an A/V receiver that forces you to use a set-up menu overlaying your image every time you need to adjust the delay, perfect lip-sync just isn’t practical. But my amplifier only has an optical input. No problem. The DD740 transmits the selected source to both outputs simultaneously. This means an a/v amplifier with just one input (optical or coax) can be used with four digital audio sources (two coax and two optical). Which types of audio signal can the DD740 delay? In order to solve lip sync issues, the DD740 delays digital audio signals passing between your source equipment (e.g. disc player, set-top box) and your home theater amplifier via a DIGITAL AUDIO CABLE. Digital audio cable is either optical (toslink) or a coax cable fitted with a single RCA phono socket at each end. NOTE: The DD740 is not directly compatible with ANALOG (stereo) audio signals. Analog audio signals use a pair of leads that connect to two RCA phono sockets (usually one with a red plastic insert and one white). However, if you use a home theater amplifier then analog sources can be used with the DD740 via an adaptor. Can the DD740 delay DTS? Yes. In fact the DD740 can delay any digital s/pdif digital audio (coax and optical) format that is used today, i.e. Dolby Digital, DTS, Dolby Digital EX, DTS 96/24, PCM, etc. Does the DD740 reduce sound quality? Absolutely Not. There is no change at all in the quality of audio when using a DD740, as the audio is being transmitted digitally. The DD740 simply stores the digital bits coming in and then outputs them, unchanged, after the delay period. Since the data is digital, a perfect copy is made with absolutely no deterioration in sound quality. Can I use the DD740 with an analog (stereo) source? Yes. All that is needed is a low cost, third-party analog-to-digital converter. This simply connects between the analog audio source and the DD740. Such a converter costs about US$40 (25GBP) or less depending on your location. Please note, the output from the DD740 is still digital audio, and so you will still need an AV amplifier with a digital audio input or a speaker system that accepts s/pdif digital audio input. How can I connect more than 4 digital audio sources? If you need to connect more than 4 digital sources, or for example have 3 sources that each require optical connections, then third-party adapters are available. For instance, to connect an optical (toslink) source to a coax input of the DD740, a simple optical-to-coax converter may be used. These are available at low prices both from online stores and at audio accessory shops in the high street. For example the unit shown on the right. It is widely available from audio accessory retailers, priced at approx US$30. Alternatively, a powered digital audio switch may be used. AVOID the use of mechanical toslink switches and splitters since they can reduce light levels and degrade the digital audio signals reaching the DD740 and may cause occasional dropouts in sound or not work at all. Toslink switches that do not require external power are definitely “mechanical” but remote controlled powered switches may also be mechanical internally. Powered switches that offer coax to Toslink and/or Toslink to coax conversion will not be mechanical and should work fine. A suitable powered digital audio switch is the Midiman CO2, for example. It will connect to two digital sources, one coax and one optical. The CO2's output connects to any of the DD740's inputs, leaving the other three inputs available for a total of 5 sources. When the time comes to use one of the inputs connected via the CO2, simply move its switch to the source required. How do I use a learning remote control with the DD740? The DD740 includes features to allow extensive control by learning remotes. What is the longest cable I can use with the DD740? We recommend that, for best results, all cables (coax and optical) are kept to the shortest lengths practical. It is not possible to say exactly what the maximum length of cable is that may be used, since that will depend on the quality and condition of the cable and also on the equipment at the other end. However, as a guide a maximum length of 5 metres (15 feet) is advisable for any cable connected to the DD740. In particular, we recommend that the DD740 is positioned near to your digital audio source and connected to it using short cables. Problems that may occur if a cable is too long include audio drop outs (occasional short periods of silence) or loss of audio altogether. Less than 2 Watts for the DD740 from 9VDC. AC power consumption will depend upon the country specific power adaptor used with the unit but will not exceed 5 watts in any case. The DD740 is compatible with learning remote controls, providing seamless integration with your A/V system. Every learning remote is capable of replicating the IR commands of the DD740's own remote control. Please refer to the instructions that accompany your learning remote for details of how to do this. In addition, the DD740 has extra IR commands that can be programmed into more sophisticated learning remotes such as the Philips Pronto and ProntoNEO. By sequencing these commands, total control of the DD740 may be achieved. For example, turning on the DD740, selecting the input, selecting the delay preset and even setting its display brightness, all from a single button press on your learning remote. *Only available when using a suitable programmable learning remote control. When purchasing you will be paying and dealing directly with the third party seller 'LipFix.com'.